An ice age is a period of long-term downturn in the temperature of Earth's climate, resulting in an expansion of the continental ice sheets, polar ice sheets and mountain glaciers ("glaciation"). Glaciologically - Ice age is often used to mean a period of ice sheets in the northern and southern hemispheres; by this definition we are still in an ice age (because the Greenland and Antarctic ice sheets still exist). More colloquially, when speaking of the last few million years, ice age is used to refer to colder periods with extensive ice sheets over the North American and Eurasian continents: in this sense, the last ice age ended about 10,000 years ago. The idea that, in the past, glaciers had been far more extensive was folk knowledge in some alpine regions of Europe (Imbrie and Imbrie, p25, quote a woodcutter telling Jean de Charpentier of the former extent of the Swiss Grimsel glacier). No single person invented the idea. Between 1825 and 1833, Charpentier assembled evidence in support of the concept. In 1836 Charpentier convinced Louis Agassiz of the theory, and Agassiz published it in his book ƒtude sur les glaciers (Study of Glaciers) of 1840. The earliest hypothesized ice age is believed to have occurred around 2.7 to 2.3 billion (109) years ago during the early Proterozoic Age. The earliest well-documented ice age, and probably the most severe of the last 1 billion years, occurred from 800 to 600 million years ago (the Cryogenian period) and it has been suggested that it produced a Snowball Earth in which permanent sea ice extended to or very near the equator. It has been suggested that the end of this ice age was responsible for the subsequent Cambrian Explosion, though this theory is recent and controversial.A minor ice age occurred from 460 to 430 million years ago, during the Late Ordovician Period. A minor ice age occurred from 460 to 430 million years ago, during the Late Ordovician Period. There were extensive polar ice caps at intervals from 350 to 260 million years ago, during the Carboniferous and early Permian Periods, associated with the Karoo Ice Age. The present ice age began 40 million years ago with the growth of an ice sheet in Antarctica, but intensified during the Pleistocene (starting around 3 million years ago) with the spread of ice sheets in the Northern Hemisphere. Since then, the world has seen cycles of glaciation with ice sheets advancing and retreating on 40,000 and 100,000 year time scales. The last glacial period ended about 10,000 years ago. The timing of ice ages throughout geologic history is in part controlled by the position of the continental plates on the surface of the Earth. When landmasses are concentrated near the polar regions, there is an increased chance for snow and ice to accumulate. Small changes in solar energy can tip the balance between summers in which the winter snow mass completely melts and summers in which the winter snow persists until the following winter. Due to the positions of Greenland, Antarctica, and the northern portions of Europe, Asia, and North America in polar regions, the Earth today is considered prone to ice age glaciations. Evidence for ice ages comes in various forms, including rock scouring and scratching, glacial moraines, drumlins, valley cutting, and the deposition of till or tillites and glacial erratics. Successive glaciations tend to distort and erase the geological evidence, making it difficult to interpret. It took some time for the current theory to be worked out. Analyses of ice cores and ocean sediment cores unambiguously show the record of glacials and interglacials over the past few million years. An international team of researchers has found evidence supporting a theory that suggests a missing crust layer can be blamed on "Snowball Earth." The researchers suggest that the large erosion event was the development of what has been termed "Snowball Earth" - a period when the entire planet was completely covered with ice. They believe that as the ice receded, it took a whole layer of the crust with it, dumping it into the sea. If that was the case, logic suggests, testing the seafloor should show a large layer of rock from that time period. But no such layer has been found. The researchers suggest this is because the rock was pulled into the Earth's interior by the movement of the tectonic plates occurring at the time. When ice possibly swathed the entire world, the oceans underneath may have nevertheless surprisingly churned, potentially helping to provide life with vital nutrients, new research suggests. For decades, scientists have proposed that the planet may once have been a "Snowball Earth," with geological evidence suggesting ice reached all the way to the equator at least twice during the Neoproterozoic era (about 635 million to 750 million years ago) in stints lasting millions of years. The ice sheets blanketing Earth were not completely solid - there were likely many holes or thin patches around warm spots such as volcanoes - but in many other places, ice may have been more than a half-mile thick. Although increasing levels of greenhouse gases in the Earth's atmosphere these days are seen as a harbinger of doom, millions of years ago they may have rescued the planet from a deep freeze. Some researchers believe that at points in our planet's history - at least two, possibly three times - ice blanketed its surface, down to the equator and across the oceans, forming a "Snowball Earth." But new research raises questions about whether a surge in carbon dioxide - one of the greenhouse gases responsible for modern, human-caused global warming - could have been responsible for the big thaw that followed the most recent Snowball Earth, about 635 million years ago. And if there wasn't a greenhouse effect big enough to melt the thick veil of ice, perhaps, the researchers suggest, Earth may not have been a big, icy snowball at the time. The cause of ice ages remains controversial for both the large-scale ice age periods and the smaller ebb and flow of glacial/interglacial periods within an ice age. The general consensus is that it is a combination of up to three different factors: atmospheric composition (particularly the fraction of CO2 and methane), changes in the Earth's orbit around the Sun known as Milankovitch cycles (and possibly the Sun's orbit around the galaxy), and the arrangement of the continents.  The first of these three factors is probably responsible for much of the change, especially for the first ice age. The "Snowball Earth" hypothesis maintains that the severe freezing in the late Proterozoic was both caused and ended by changes in CO2 levels in the atmosphere. However, the other two factors do matter. An abundance of land within the Arctic and Antarctic Circles appears to be a necessity for an ice age, probably because the landmasses provide space on which snow and ice can accumulate during cooler times and thus trigger positive feedback processes like albedo changes. The Earth's orbit does not have a great effect on the long-term causation of ice ages, but does seem to dictate the pattern of multiple freezings and thawings that take place within the current ice age. The complex pattern of changes in Earth's orbit and the change of albedo may influence the occurrence of glacial and interglacial phases - this was first explained by the theory of Milutin Milankovic. The present ice ages are the most studied and best understood, particularly the last 400,000 years, since this is the period covered by ice cores that record atmospheric composition and proxies for temperature and ice volume. Within this period, the match of glacial/interglacial frequencies to the Milankovic orbital forcing periods is so good that orbital forcing is the generally accepted explanation. The combined effects of the changing distance to the sun, the precession of the Earth's axis, and the changing tilt of the Earth's axis can change and significantly redistribute the sunlight received by the Earth. Of particular importance are changes in the tilt of the Earth's axis, which impact the intensity of seasons. For example, the amount of solar influx in July at 65 degrees north latitude is calculated to vary by as much as 25% (from 400 W/m2 to 500 W/m2, see graph at). It is widely believed that ice sheets advance when summers become too mild to melt all of the accumulated snowfall from the previous winter. Some workers believe that the strength of the orbital forcing appears to be too small to trigger glaciations, but feedback mechanisms like CO2 may explain this mismatch. While Milankovic forcing predicts that cyclic changes in the Earth's orbital parameters can be expressed in the glaciation record, additional explanations are necessary to explain which cycles are observed to be most important in the timing of glacial/interglacial periods. In particular, during the last 800 thousand years, the dominant inter/glacial oscillation has been 100 thousand years, which corresponds to changes in Earth's eccentricity and orbital inclination, and yet is by far the weakest of the three frequencies predicted by Milankovic. During the period 3.0 - 0.8 million years ago, the dominant pattern of glaciation corresponded to the 41 thousand year period of changes in Earth's obliquity (tilt of the axis). The reasons for preferring one frequency to another are poorly understood and an active area of current research, but the answer probably relates to some form of resonance in the Earth's climate system. The "traditional" Milankovitch explanation struggles to explain the dominance of the 100,000-year cycle over the last 8 cycles. Richard A. Muller and Gordon J. MacDonald and others have pointed out that those calculations are for a two-dimensional orbit of Earth but the three-dimensional orbit also has a 100 thousand year cycle of orbital inclination. They proposed that these variations in orbital inclination lead to variations in insolation, as the earth moves in and out of known dust bands in the solar system. Although this is a different mechanism to the traditional view, the "predicted" periods over the last 400,000 years are nearly the same. Another worker, Ruddiman has suggested a plausible model that explains the 100,000 cycle by the modulating effect of eccentricity (weak 100,000 year cycle) on precession (23,000 year cycle) combined with greenhouse gas feedbacks in the 41,000 and 23,000-year cycles. Yet another theory has been advanced by Peter Huybers who argued that the 41,000-year cycle has always been dominant, but that the Earth has entered a mode of climate behavior where only the 2nd or 3rd cycle triggers an ice age. This would imply that the 100,000-year periodicity is really an illusion created by averaging together cycles lasting 80 and 120 thousand years. This theory is consistent with the existing uncertainties in dating, but not widely accepted at present. During the most recent North American glaciation, the Wisconsin glaciation (70,000 to 10,000 years ago), ice sheets extended to about 45 degrees north latitude. This Wisconsinian glaciation left widespread impacts on the North American landscape. The Great Lakes and the Finger Lakes were carved by ice deepening old valleys. Most of the lakes in Minnesota and Wisconsin were gouged out by glaciers and later filled with glacial meltwaters. The old Teays River drainage system was radically altered and largely reshaped into the Ohio River drainage system. Other rivers were dammed and diverted to new channels, such as the Niagara, which formed a dramatic waterfall and gorge, when the waterflow encountered a limestone escarpment. Another similar waterfall near Syracuse, New York is now dry. Long Island was formed from glacial till, and the watersheds of Canada were so severely disrupted that they are still sorting themselves out - the plethora of lakes on the Canadian Shield in northern Canada can be almost entirely attributed to the action of the ice. As the ice retreated and the rock dust dried, winds carried the material hundreds of miles, forming beds of loess many dozens of feet thick in the Missouri Valley. Isostatic rebound continues to reshape the Great Lakes and other areas formerly under the weight of the ice sheets. The Driftless Zone, around the junction of Wisconsin, Minnesota, and Iowa, was not covered by glaciers. There have been four major periods of glaciation in the Earth's past. 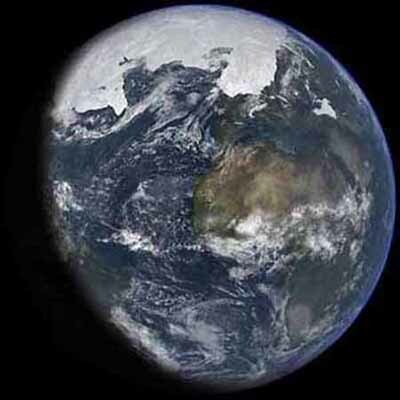 The first, and possibly most severe, may have occurred from 800 Ma to 600 Ma (million years ago, the late Proterozoic Age) and it has been suggested that it produced a "Snowball Earth" in which the earth iced over completely. It has been suggested also that the end of this cold period was responsible for the subsequent Cambrian Explosion, a time of rapid diversification of multicelled life during the Cambrian era. However, this theory is recent and controversial. A minor series of glaciations occurred from 460 Ma to 430 Ma. There were extensive glaciations from 350 to 250 Ma. The present Pleistocene ice age has seen more or less extensive glaciation on 40,000 and later, 100,000 year cycles. The last glacial period ended about 10,000 years ago. Researchers have revealed how sea ice has been contributing to the waxing and waning of ice sheets over the last million years. A new study has shown for the first time that ice ages, occurring every 100,000 years, are accompanied by a rapid build-up of sea ice in the Earth's oceans. Our planet's ice ages used to occur at intervals of every 40,000 years, which made sense to scientists as the Earth's seasons vary in a predictable way, with colder summers occurring at these intervals. However there was a point, about a million years ago, called the 'Mid-Pleistocene transition', in which the ice age intervals changed from every 40,000 years to every 100,000 years. For hundreds of millions of years, Earth's climate has remained on a fairly even keel, with some dramatic exceptions: Around 80 million years ago, the planet's temperature plummeted, along with carbon dioxide levels in the atmosphere. The Earth eventually recovered, only to swing back into the present-day ice age 50 million years ago. Now geologists at MIT have identified the likely cause of both ice ages, as well as a natural mechanism for carbon sequestration. Just prior to both periods, massive tectonic collisions took place near the Earth's equator - a tropical zone where rocks undergo heavy weathering due to frequent rain and other environmental conditions. This weathering involves chemical reactions that absorb a large amount of carbon dioxide from the atmosphere. The dramatic drawdown of carbon dioxide cooled the atmosphere, the new study suggests, and set the planet up for two ice ages, 80 million and 50 million years ago. A recent study, led by Dr James Rae of the University of St Andrews, found that changes in ocean circulation in the North Pacific caused a massive 'burp' of CO2 to be released from the deep ocean into the atmosphere, helping to warm the planet sufficiently to trigger the end of the ice age. Previously, scientists have suggested that the Antarctic Ocean and North Atlantic were the only places likely to release deglacial CO2, due to their deep water formation. However, a change in rainfall over the North Pacific region, caused by the East Asian monsoon and the Westerly storm track, made the ocean surface saltier and less buoyant, allowing it to form deep water. This allowed CO2 stored in the deep Pacific to be released to the atmosphere, where it helped warm the planet and melt back the ice sheets that covered much of the Northern Hemisphere. Science has struggled to explain fully why an ice age occurs every 100,000 years. As researchers now demonstrate based on a computer simulation, not only do variations in insolation play a key role, but also the mutual influence of glaciated continents and climate. Ice ages and warm periods have alternated fairly regularly in Earth's history: Earth's climate cools roughly every 100,000 years, with vast areas of North America, Europe and Asia being buried under thick ice sheets. Eventually, the pendulum swings back: it gets warmer and the ice masses melt. While geologists and climate physicists found solid evidence of this 100,000-year cycle in glacial moraines, marine sediments and arctic ice, until now they were unable to find a plausible explanation for it. Scientists have unearthed six fishhooks, the oldest of which was made from a 19,000-year-old mammoth tusk. Hunters of ice age reindeer around 12,300 years ago likely left the fishhooks, along with mammal and fish bones, in an open field in what is now Wustermark, Germany. The fishhooks, which are the oldest found in Europe, suggests humans developed fishing tools earlier than previously thought, probably to catch fast-moving fish that appeared in lakes as the climate warmed. Primitive moss-like plants could have triggered the cooling of the Earth some 470 million years ago, say researchers. A study published in Nature Geoscience may help explain why temperatures gradually began to fall, culminating in a series of "mini ice ages". Until now it had been thought that the process of global cooling began 100 million years later, when larger plants and trees emerged. The simple plants' interactions with rocks are believed to be the cause. The humble moss has created the climate which we enjoy today. Oxford University is involved in a research project to unearth 30,000 year old climate records, before they are lost forever. The rings of preserved kauri trees, hidden in New Zealand's peat bogs, hold the secret to climate fluctuations spanning back to the end of the last Ice Age.